*Are children allowed to pick? Yes. We always encourage parents to bring their kids along. We feel it is very important for people of all ages to see where their food comes from and how a farm operates. We just ask that all children are supervised at all times. Anyone not following this rule will be asked to leave for safety reasons. *Should I wash my fruit before it is processed? Yes/No. It depends upon what type of berry you are processing. When I freeze strawberries or blueberries, I rinse them in case they are sandy. I do not rinse raspberries because they are too fragile although some of our customers do. The key to rinsing and freezing is to ensure that before you place them in a container that they are as dry as possible. The less moisture, the less freezer burn and clumping. Laying them out on a towel for a short period of time will help. The dryer they are the better they keep. *Is it okay to bring our dog along? No. Please know we are animal lovers ourselves. For the safety of your pet and our customers we ask that you leave your four legged family members at home. Thank you. *Should we wash the fruit before we eat it? Yes. Our family is fortunate enough to live steps away from the fruit that we grow. We eat the fruit directly from the field and have so for decades. We always use our own judgement and we ask that our customers do the same. If a berry appears to be soiled then please do wait until you get home to wash and then enjoy. *Is your farm certified organic? No. We feel that this question involves a more in depth answer so please return back to our homepage for a more detailed response and click on the tab labeled "Farming Practices"
*Should I bring my own container to pick into/take home? Yes. We appreciate it when our customers bring their own containers such as buckets, dishpans, or boxes. This helps to cut down on waste both on your part and on ours. We will then weigh your berries by the pound. *The weight of your container will be placed on a sticker and attached to your container prior to you picking. This enables us to subtract the weight of the container from the total pounds picked. *Do you have containers at the farm if I forget mine? Yes. We do have 5 quart buckets for $1 each if you happen to forget your containers at home. If you are like me, I would be in the car before I realized they were on the kitchen table at home. Each one of these is shallow and can be brought back year after year if you wish. Yes. At this time, we accept cash, credit/debit, or Farmers Market Nutrition Program Checks as forms of payment. All purchases of $20 or less must be paid for in cash. Yes. We have two portable toilets for your convenience and hand washing stations. *Do berries travel well in the summer if I am coming from a distance? No. Once a berry is picked and placed in a hot car for awhile they can go right to mush. We have had many customers who bring along a cooler to set them down into to help ensure their quality until they reach their final destination. *Are we allowed to take photos? Yes/No. A lot of the families, grandparents, or young college students that come to pick like to take photos on their phones or personal cameras while picking. We have no problem with capturing a moment in time especially when it is a wonderful memory for so many. We do not allow professional photography or photo shoots of any nature on our farm at this time. Our farm is also our home and we would like to keep our privacy the best we can for our family. *Are we allowed to eat the berries while we pick? Yes. 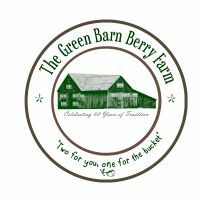 We offer numerous varieties of berries to choose from. We don't mind if you taste test one every now and again. What might taste sweet to one person could possibly be sour to another. We also would like to remind visitors that the berries we grow and tend to year round are our livelihood. Please be mindful of how many you taste test. Thank you.